One of the favorite things we like to do is watch Diners, Drive-ins and Dives on television. Guy Fieri is the coolest chef and watching his show leaves you with hunger for some good cooking. We’ve been to some of the restaurants he has featured and eaten some mouthwatering, good grub. When it comes to ribs however, he describes every spice, brown sugar and flavor so you are crazy with anticipation for that next meal. 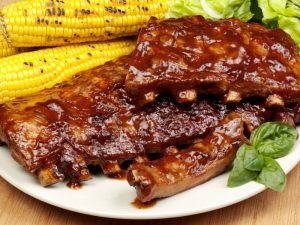 His one word description for his special ribs – they are “righteous”. Odd choice of words. Righteous ribs. I think that is what Adam had – that is until the fall, then everything got kind of messed up. The early couple were called many things but “full” probably wasn’t one of them as they traded out their hunger for temporary fulfilment. Chili’s restaurant jingle comes to mind, “I want my baby back babyback babyback ribs”. God takes his time slow cooking up salvation because those things that are sweetest and best take preparation and time. Holiness is the attribute most know about God. God can make people holy but righteousness; well that’s a whole new twist. Holiness means we are pure before God, righteousness means we act purely towards others. Righteousness is “holiness” in relation to others. We act towards people in a certain way but if it is fair, just and equitable we can say righteousness is having her perfect work in someone. The only hope we have of being righteous with others is by looking at God’s example – He is righteous towards everyone, though our modern culture would accuse Him otherwise. Last month I raced to write the blog and wrote about the topic at hand (holiness). Some asked if I was referring to something specific (I wasn’t, just addressing the topic). Soon after I got emails about a mega church falling into moral decline. Because I wrote about things in advance someone asked if I knew the “inside” scoop. No, just writing what I felt led to write. I was shocked to hear some of the stories. While I allude to leadership issues or mention me-too out of a desire to address the “contemporary issues”, I was not directing any comments to those events. Some want things swept under the rug and some want the removal of leaders when there are issues. When the storm hits people like to cook up their own theology which makes things messier. This week our topic is being “righteous” and that we must act towards one another as God acts towards us – in a morally righteous and pure way. Some like to pile on shame, blame and punishment which are contrary to God’s character and inadvertently pull themselves into the unholy mess. Evil also likes to spread out and multiply. Vertical relationship with God is essential and only possible through the work of the cross. Horizontal relationships – meaning with other people, are only possible when done through the work of the cross. If we have died to our “rights” and ego’s that means we do everything possible to make amends. That does not mean one person wins and the other loses, it means Christ wins and all come before Him to work it out with humility and vulnerability. This is not easy and as I write this I realize my “want to” is a lot stronger than my muscles to accomplish such things. Maybe that is why grace and patience are required to walk things out. Above all, the power of the Holy Spirit is needed – but must be invited into the equation. Romans 3:10 tells us, “none is righteous, no, not one; no one understands, no one seeks for God. All have turned aside; together they have become worthless; no one does good, not even one.” Serious words. Notice that the only thing they do together is – become worthless! So what do we do then? Romans 3:22 tells us, “This righteousness is given through faith in Jesus Christ to all who believe.” We need the example and life of Jesus to be righteous. Many religions point to ways to be a good human being. Christianity points out that there is only one and it is not me (or you) but the Christ. While religion points to abstaining from drinking, wearing makeup, some even follow rituals or habits but the Hebrew understanding of righteousness (tzdiq) is that of nomadic people following a pathway. The idea is not to “appear” holy but to follow in the path of the Holy One. Image is less important then in God’s way. The Ancient Hebrew Research Center states that “A righteous person is not one who lives a religiously pious life, the common interpretation of this word, he is one who follows the correct path, the path (way) of God.” It looks less like sister Margaret wearing a dress on a Sunday and more like sister Mary going to church in spite of dealing with a drunk husband all night. It looks less like brother Carl doing avoiding drugs and more like brother Mike praying at the altar for direction when his kids have gone to jail. Following the narrow way can be painful. Choosing the narrow way and carefully following where Jesus leads takes guts, faith and patience. Not wearing teal colored eyeshadow – not so much. Seeking Christ when your world has dropped out means you single heartedly look up. It means you press in to find and follow God’s will- regardless of what the crowd says. Wearing white after labor day or abstaining from hoop earrings is just really not the point – but religion has made it that way. We have traded out vibrant, passionate lives following after the will of God for a new dress code. Righteousness must mean more. Mt.5:6 – Those who hunger and thirst after righteousness, will be filled. That’s quite the promise. When we fast is it to make God do our will or is it asking Him to place His will and ways in our lives? I want His ways but often my flesh wants what is easy. Perhaps that is why fasting is a necessary spiritual discipline – to redirect what we hunger and thirst for? My prayer for us this week is two-fold, one that we would understand and believe that God is righteous towards us – always. We can trust His character and heart. Secondly, that we can never be righteous on our own but a need a Savior and empowering Holy Spirit to help us. Wrap that in grace, mercy and patience and there is potential for wonderful relationships. In a culture and nation that is set on dishonoring, distorting and tearing down people, it would be a breath of fresh air. Help us Jesus to look to you for our actions and relationship cues. Lead and guide us in Your Truth and in the Way we should go. Thank you for being a compassionate, righteous guide. We hunger and thirst for YOU and Your ways. Amen. “I stayed up all night trying to follow the sun… Then it dawned on me” Lord help us to follow YOU in all our relationships and dealings this week.